Halfway through Virgin River, and in the middle of a storm, she has a flat tire. A motorcycle gang, or at least what she first thinks is one, stops to help her. One of the bikers is Dylan Childress, famous actor and former teenage heartthrob. He’s been out of the spotlight for a while now but she recognizes him immediately. They are both staying in Virgin River for a short time and since they feel strongly attracted to each other they decide to have a fling, a very hot and heavy fling. He is very clear about the nature of their relationship because he is weary of commitment and also because he thinks himself incapable of love due to his dysfunctional family and difficult past. Also, his business is struggling and he doesn’t have the time or the resources to be in a committed relationship. So things go well until Katie begins to fall for him and he has to leave to real life with a business nearing bankruptcy and his draining and annoying family. Will they be able to make it work? They have a difficult road ahead of them and life has a couple of surprises in store. Redwood Bend is the 18th book in the Virgin River series, the 18th! At this point in any other series I would be ready to quit, but Ms. Carr has managed to keep it fresh by adding new characters that in no way relate to the original books, thus infusing it with new blood, and making it possible for new readers to jump right in without having to go back and read the rest of the book. I think reading the previous book helps, but these new trilogies stand alone quite well and everyone should be able to enjoy them. I have mixed feelings about this book. I loved the hero, it’s one of the best she’s written, I think his life experiences clearly shaped the man he was today and it was obvious that he was a responsible, honest and hardworking guy. Yes, he suffers from the same commitment phobia that ails most romance heroes, but he makes up for it by being so mature in the other aspects of his life. His business is hurting, victim of the economy, and Ms. Carr doesn’t sugarcoat it. There are no miraculous cures for this and he is thinking about sacrifice and how to deal with the hard times throughout the whole book. So there you have it. Loved the hero, loved revisiting the town, hated the heroine. The only reason I’m giving the book a 2.5 is because the hero was awesome. If you’re a fan of the series this is a must read, I know I would read it even after knowing that I wouldn’t like the heroine. If you’re not a fan of the series and want to give it a try, this is not the right book to start with. I admit..I had to read the Spoiler lol. Oops! It happens around 75% into the book, sorry I didn't make it clearer. Then they have to deal with it before they get their HEA. It almost was the end for me, but I did read the whole thing. Ohhhhh noooooo. 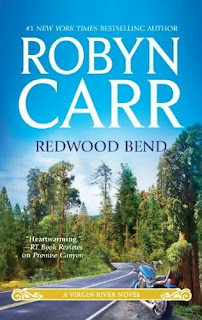 I am a huge Robyn Carr fan, but this doesn't sound like something I will enjoy. And, yes I cheated, read your spoiler (I can't NOT read a spoiler). I hate those kind of romances. I don't want unplanned babies in my romance at all. Yeck. I read the spoiler...that would drive me up the wall too. And now I have a very bad opinion of the heroine but the hero still sounds dreamy. I finally read the first in this series and it was enjoyable. Big fan of Jack. The hero is awesome! And yay you finally read the first book! If you like Jack you will be happy to know that he plays important roles in the books to come and makes appearances in almost every Virgin River book. I love him (Mel, not so much...)! I haven't read anything by this author but I've been wanting to read more romances so I might have to check out some of her earlier (in the series) books. As far as this one, ugh, some heroines are just not with it. Don't sign on for more than you can handle, ladies! :/ But Dylan sounds awesome! EXACTLY! LOL. Start with book 1, that's a safe bet, the first three books are very good. Okay, so Dylan was nice and I liked the fact he was considering "sacrificing" himself for the business. Like you, I didn't like the twist and I thought the way Katie handled was idiotic. What did you think of the bear thing? I was like, really?!? You didn’t like A Summer in Sonoma? LOL! We do have somewhat different tastes, I’ve noticed that, but I like it, you keep me guessing! That was my first Robyn Carr book so that’s probably why it’s so special to me. That’s because Virgin River is filled with mighty penises that somehow make it all work! They are like magic wands for adults. They make bad boys settle down and city girls feel at home in godforsaken mini towns with just the one street, bar, church and no supermarket or anything else. The bear! I knew I was being too nice when I gave the book a 2.5… Let’s not talk about the bear, please. Ohhhh, yeah, first book by an author is always special :) I don't know, I guess some of the stuff in A Summer in Sonoma just rubbed me the wrong way! And LOL, yes, let's not talk about the bear then. Robyn Carr is an auto buy for me. I just love this Virgin River sereis.. I loved the twins in the book.. I have twin neice an nephew and I could relate to the twins in the book.. What one does not get into, especially at age five, the other will... I love how Katie put her children first before her love for antoher man... Kudos to Robyn for another graet VR book.. The twins were my favorite part of the book. They were realistic and normal, usually kids in romance novels behave like tiny adults, so it was great to see a couple of little kids being actual little kids.